I was recently asked my opinion about music lessons for children in the context of a grandchild who at age 3 could pick out a tune he only heard once on the piano and even play chords. 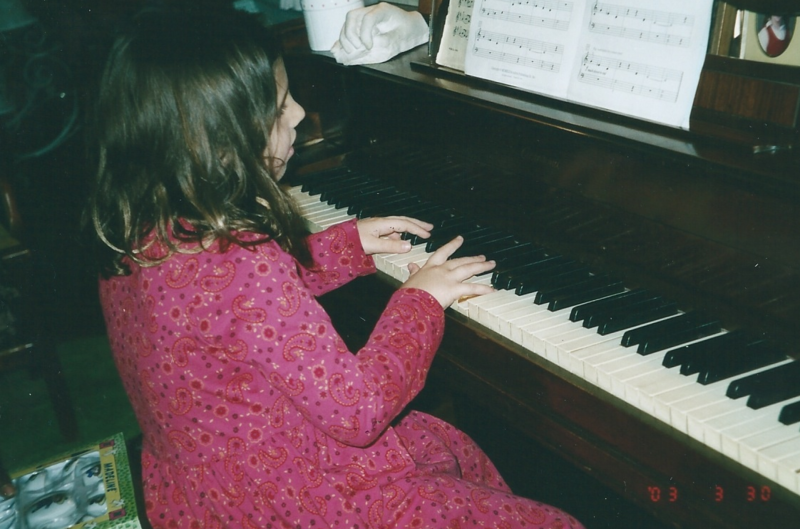 When I was growing up — and I did not live in an affluent neighborhood — it seemed as though every house had a piano and nearly every child took piano lessons. I still think ALL CHILDREN should be exposed to music both at home and in school. Ideally every child would learn to sing, read music, and play an instrument well enough to have fun. Music enriches our lives, enhances self-expression, and teaches us discipline. Music may even increase the connections in our brain. It’s too bad that we no longer find a piano in every home. And many school districts have de-emphasized music and art. If this musical little boy were my child — I agree his aptitude sounds astonishing — I would have him evaluated by a competent music teacher and get a second opinion just as I would before elective surgery. It’s important to know as early as possible whether a child is gifted or not. Americans once had a fear of giftedness. The gifted child was thought to be unhappy, friendless, “nerd-like,” uncoordinated in sports, and lacking in social skills. Further, the gifted child was supposedly doomed to an unhappy childhood and an unhappy adult life as well. The term we use today is “gifted and talented” to include outstanding abilities in the performing or visual arts as well as a high IQ and academic ability. We now know that gifted people are more, not less, stable and that the giftedness persists in adult life. And gifted children become productive, well-liked, and well-rounded adults who are often chosen as leaders. People come with different abilities. Some of us are very good at small-muscle activities (surgeons and seamstresses); some at large muscle activities (athletes); some are good at thinking; some are creative; some have high levels of intuition and sensitivity. Most of us have reasonable levels of ability in several areas, or we learn how to compensate for any deficit or avoid what we’re not good at. Some of us are born gifted/talented — approximately 2.5 million children fall into the gifted/talented category — which is part of the child’s uniqueness and should be nourished, just as the child’s body needs to be nourished. Very rarely is a child born with a truly exceptional talent. A prodigy is defined as a child who performs at the level of an adult. Such prodigies seem to be “pre-tuned” to learn rules and techniques at a very fast rate. Prodigies are found in three fields: music, chess, and mathematics, no doubt because performance in these disciplines is largely based on complex rule structures rather than being dependent on years of worldly experience. Sometimes parents are frightened or even embarrassed by a mega-talent in their child. Why? Because it sets their child apart, and coping with difference can be troublesome. Parents worry about the child being “labeled” and parents are asked to provide special, enriching experiences for the gifted child which can be difficult, expensive, and time-consuming. Sometimes parents are worried that their child will grow too smart for them or will become famous and leave the parents behind. First, make a “diagnosis.” Find out how talented the child is. Another Mozart? An aptitude so music will come easy? If a child is truly talented the parents, along with the music teacher and the school, should come up with an educational plan to include music lessons and practice time. Accept the child. You cannot take talent away any more than you can make it happen. At the same time treat the child as normally as possible. Assign chores. Involve the child in sports. See that there is time for play and birthday parties. Because a talented child will spend a good deal of time alone practicing, balance this with time with friends. Protect the child from exploitation. Buy the best possible instruments and hire the best possible teachers because talent can be tarnished by poor training — as talent without training may wither. What about music lessons for the musically “average” child? If you are a musical family or if the child expresses an interest in music lessons, by all means start lessons. Piano is the traditional first instrument, but you can also look into Suzuki classes on the violin for preschoolers. If you don’t have a piano, renting is an option until you have some idea of your child’s aptitude and sustained interest. Plan to practice with the child at least in the beginning. Set aside a convenient time and establish a comfortable routine. Even if you are not musical yourself, you should be there to keep your child from getting stuck especially right after a lesson. Even young children should learn what the word “commitment” means. If you start lessons, the child understands that lessons will continue for at least a year. Then, if the child really dislikes music or has very little talent, reevaluate whether to continue or not. Music requires more than practice. In order to succeed at music a child needs a capacity for hard work, dedication, self-discipline, desire, and interest. It’s not enough to play Chopsticks or pick out melodies on the piano. You also have to dig in and learn notation, the difficult language of music. The reward for this hard work and discipline is a lifetime of enjoyment, as musical competency provides both solitary and social pleasure. This entry was posted	on Friday, August 23rd, 2013 at 9:19 pm	and is filed under School and Learning. You can follow any responses to this entry through the RSS 2.0 feed. You can leave a response, or trackback from your own site.